They say never bring up politics or religion in social settings; I think you can add sports to that list. Recently I was having dinner with friends at a place that had the World Cup on monitors around the room, when one person at the table mentioned he heard that 100,000 Americans are in Brazil for the event. My response, “That’s probably the entire number of American soccer fans,” was met with several audible harrumphs. While I have to admit that I’m not much of a sports aficionado, it was not always so. I used to be an avid Cleveland Browns fan. I was a fan from the Jim Brown days through the 1981 “Interception,” the 1987 “Drive,” and the 1988 “Fumble.” There isn’t a seasoned Browns fan alive that doesn’t understand the agony those terms refer to. Then came the player strikes. When players getting millions of dollars a year started whining about limousine service, I lost interest in football and sports in general. As to the “other football” sport, I’m admittedly daft enough (by global standards) that I couldn’t care less about it. And in spite of a record number of Americans watching the US World Cup games, the stats suggest that most Americans care about World Cup soccer the way we do about Olympic bobsledding; they’re special events. In a 2014 poll, America’s favorite professional sport is football (35%) followed by baseball at a distant second (14%). Basketball and hockey come in even further behind with 6% and 5% respectively. In the cited poll, soccer doesn’t even make honorable mention. Although there are indications that may be changing, considering soccer is the world’s most popular sport, why isn’t it also popular in America? The answer to that question requires looking at how a sport interweaves with a country’s culture and history. For example, how Canadians and residents of other northern countries view hockey is an example of a sports attitude based on latitude. Looking at America’s national psychology we can see one important constant: Americans like offense. From the Louisiana Purchase, to westward expansion, to landing on the moon. Even in our private industries, we have admired offense: railroads, oil, energy, automotive, communications, electronics, software, etc. In Alexis de Tocqueville’s Democracy in America, Americans are described as more active and industrious than Europeans because Americans have a different ethos. What Europeans chastise as an immoderate desire for wealth, Americans regards as praiseworthy and industrious. What Europeans regard as moderation of desires, Americans call faint of heart. I believe America’s love affair with offense drives American Exceptionalism. Our problem with soccer is that it is a defensive sport. It is a European (and rest of world) sport. I believe this is what de Tocqueville would have written if he wrote Soccer in America. Determining whether a sport is offensive or defensive can be tricky, but I’m going to concentrate on what I call “scoring events per game.” A scoring event is that direct action that results in a change in the game’s score. Thus, a goal in soccer is a scoring event. However, a hit in baseball is not necessarily a scoring event unless it causes a runner to cross home plate. For baseball, hockey, and soccer, the final score is equal to the total number of scoring events. Basketball and football require a more detailed analysis. In basketball, there are three different ways to score that result in 3, 2, and 1 point scoring events. In football, there are five different scoring events that result in points of 6 (touchdown), 3 (field goal), 2 (safety), 2 (conversion), and 1 (extra point). With all that in mind, the problem with soccer is after two or more hours of play, you end up with little to show for it. A quick review of final scores, including the current 2014 World Cup, and you see that games consist of an average of two to three scoring events. Football, on the other hand, given the five ways to score, results in about 12 scoring events per game. There is also a game’s tempo, defined as the ratio of play time versus real time. Football has a tempo of about 1 to 3. Soccer has a tempo greater than 3 to 4 since except for halftime, soccer has very few clock interruptions. However, it fails to do anything with the time, unless you count kicking the ball back and forth across the field exciting. We can’t leave this discussion without mentioning baseball. The poll cited earlier mentions that thirty years ago baseball was practically tied with football as America’s favorite sport; it is now a distant second. The average baseball game has about half the number of scoring events per game (the same is true for hockey) compared to football. But what makes baseball suffer is its tempo. A simple analysis of the time for typical pitches, hits, runs, and other parts of the game when the ball is actually in motion amounts to about 10 minutes out of nearly 3 hours, or a tempo of 1 to 18. Even doubling the estimate to take into account a possible error in estimating the action gives a tempo of 1 to 9. If baseball doesn’t pick up the pace, the national pastime may end up past its time. Fortunately, the slow pace of baseball has gotten some much needed attention. The question whether soccer may eventually grow to be a major sport in America is difficult to answer. It certainly is being helped by the push to enroll children in soccer teams at a young age. One reason is parents and society in general, sees soccer as a non-contact sport and thus safer. (A non-contact sport is one where the rules are written to minimize — not, of course, to eliminate — body contacts.) Keep in mind that American society has been severally criticized for being violent, and some have made correlations to capitalism and other parts of our “ethos.” Recently, that animosity has spilled over into critiques of football head injuries. 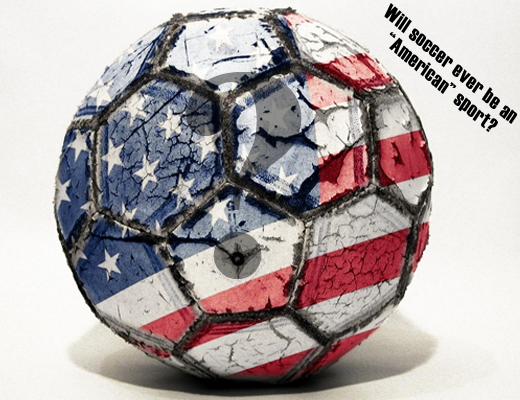 Offense or defense, football or soccer — which way will America continue to trend? Like many matters of sports, that probably depends on our goal. . . .